Leading major change initiatives means facing key challenges that range from securing senior management buy-in and sponsorship for change right through to overcoming resistance from the people on the frontline who are impacted most heavily by the change. 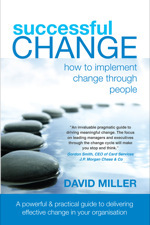 In his book Successful Change, David shares his insights from the experiences that he and his colleagues at Changefirst have amassed in the process of training and working with over 10,000 people in 35 different countries. 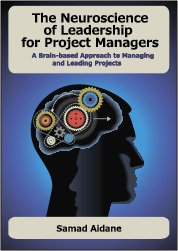 The book is full of practical and easy to understand proven techniques that have been successfully applied to a wide range of change challenges and that we can apply immediately in our projects. David Miller has spent the last 25 years helping organizations implement major change. He has extensive expertise in directly managing major changes including strategy implementation, technology implementation, business process changes, restructuring and quality management. In 1995, David founded Changefirst, to help businesses build competitive advantage through creating and sustaining organizational change capability. Through 25 years experience of change implementation, David has developed a deep belief that to successfully change, organizations must build their own capability to transform themselves and not be dependent on external support. His academic background is in Economics, Politics and Psychology. He has lived and worked in Europe and the United States as well as spending time working in Asia. Since 1995, ChangeFirst has been helping people and organizations implement change successfully. By using their own proven change management methodology, People Centred Implementation (PCI), they help enterprises and project managers be successful in change by focusing on the effective engagement of people. Thanks for the pointer to David’s book. Good stuff. I find one of his first comments to be really key and that’s “successful implementation is not free”. I appreciate David being up front and telling it as it should, which is good things take work, focus, and commitment to happen. At PIEmatrix, we see a number of our customers who dedicate key individuals to facilitate process improvements are the ones who succeed as compared to those who push it on someone’s already-full-plate to tackle. David’s book is on my reading list target. Thanks again. Thanks for recommending David’s book. Change management is always a difficult subject. People tend to oppose to change. What sort of push-back is predictable when a major change program gets under way? How much resistance is “reasonable”? Some 20 percent of the people are “change-friendly.” They’re clear advocates who willingly embrace the change. You can depend on them to help drive the program. Another 50 percent of the folks sit on the fence. They assume a so-called neutral position, trying to figure out which way to lean. They’re not necessarily hostile to change, but they’re not helping like they should. The remaining 30 percent are the resisters. They’re antagonistic toward change and often deliberately try to make it fail. Thank you for these insights. that last 30 percent of the resisters can certainly derail an initiative if not handled effectively. I think developing the capacity to go into a change initiative knowing about these 3 types of responses and being mindful about how to leverage each group is definitely a critical skill for project success. Thank you again for your contribution.